lolMiner-mnx is a new miner for Mining MinexCoin (MNX) or any other coin that uses the Equihash 96/5 algorithm. Do note that the this is not the same algorithm used by ZCash (ZEC), there it is Equihash 200/9, so this miner is not compatible for mining traditional Equihash coins. 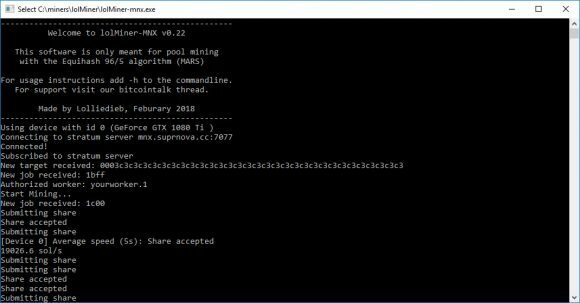 The lolMiner-mnx is a closed source OpenCL miner being developed from scratch, so it is not based on existing opensource code. Currently it is available as 64-bit binary releases for both Linux and Windows, although it uses OpenCL it should compatible with pretty much any GPU including Intel and Nvidia and not only AMD. The miner still needs some work, especially on Nvidia GPUs where by default it is pretty heavy on the CPU load and memory usage as well. 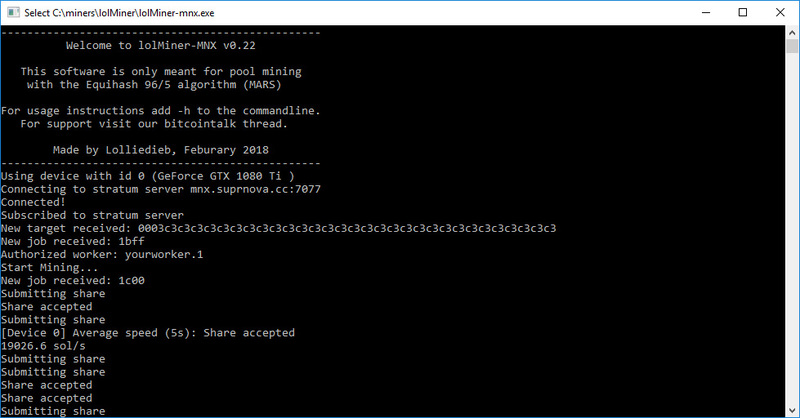 It is recommended that Nvidia users add the parameter --enable-nv-hotfix in order to reduce the CPU load a bit, but still running the miner on the main GPU may make the system a bit unresponsive even with that parameter. Still if you are interested in mining MNX (even with the high hashrate and low block reward at the moment) or any other Equihash 96/5 coin you might want to check the lolMiner-mnx out. Linux users can also use the Optiminer/Equihash miner as a solution for mining different variations of the Equihash algorithm (Equihash 200/9, Equihash 192/7, Equihash 96/5). A Windows version is supposed to come out at some point, but it is still not available for the moment.